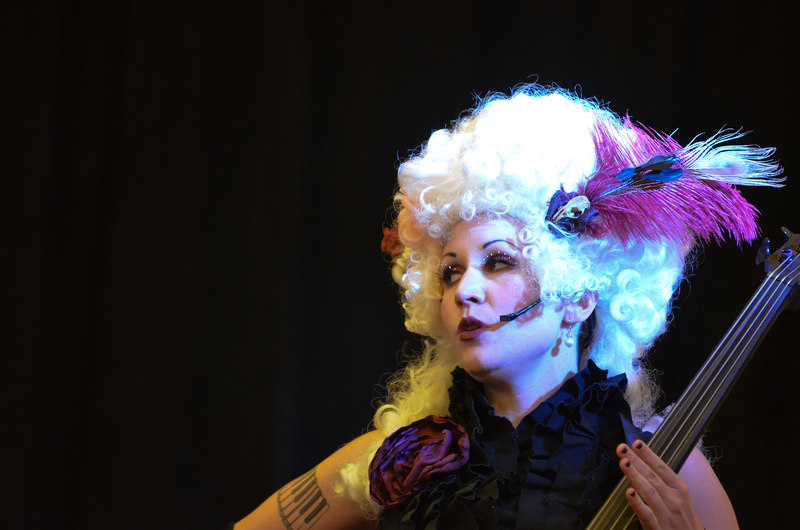 Unwoman (aka Erica Mulkey) is a San Francisco-based cellist-singer-songwriter. 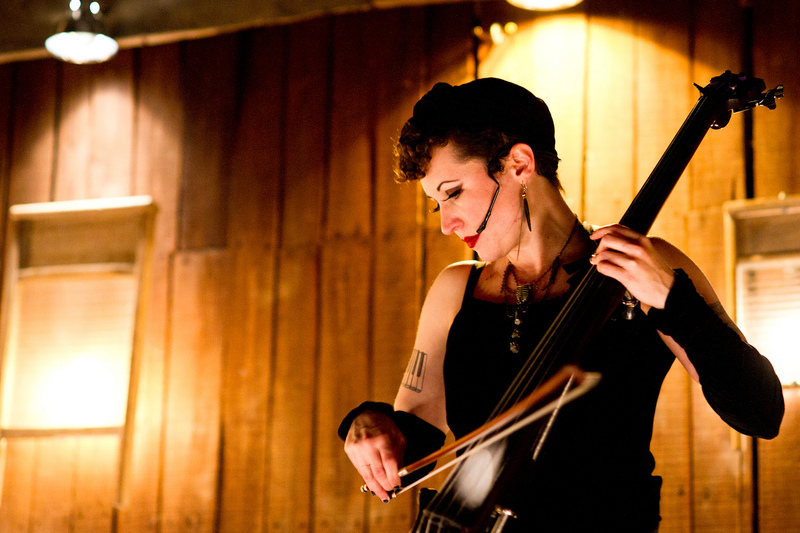 Layered with skillful cello, rich vocals, and beats, her music is a darkly futuristic homage to her classical training. Her song "The Heroine" was the weather in Welcome to Night Vale's "Triptych" episode. Vintage Tomorrows, a feature documentary about steampunk, includes that song and other footage of Unwoman. 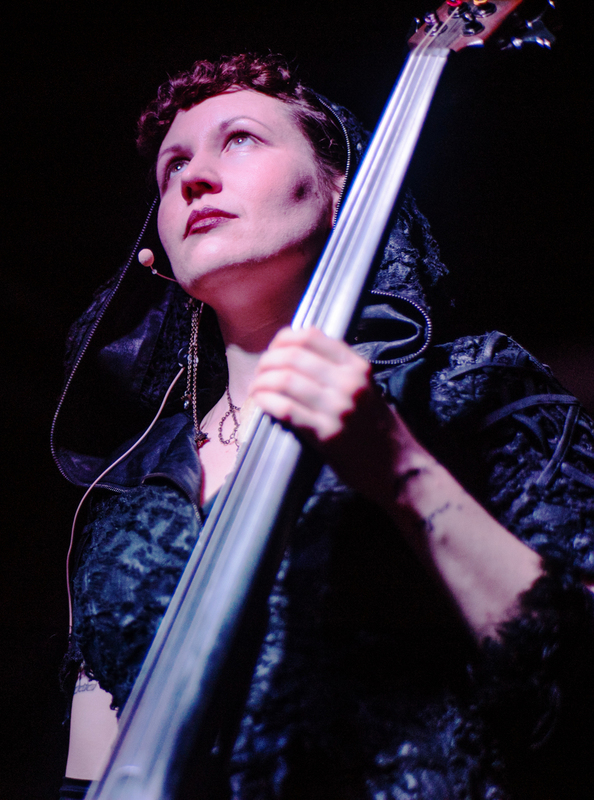 Unwoman has performed solo at major steampunk, goth, and sci-fi-related events all over the United States. 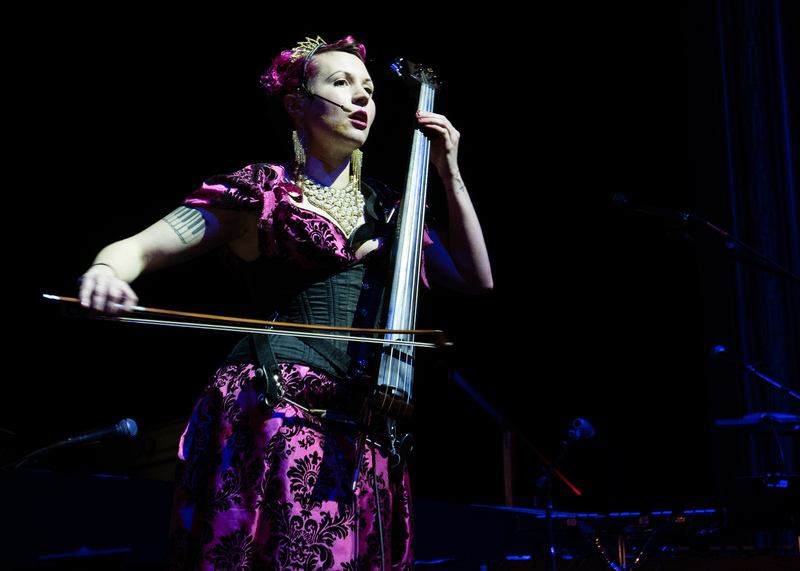 Most live solo shows use electric cello played standing up, and live-looping accompaniment. 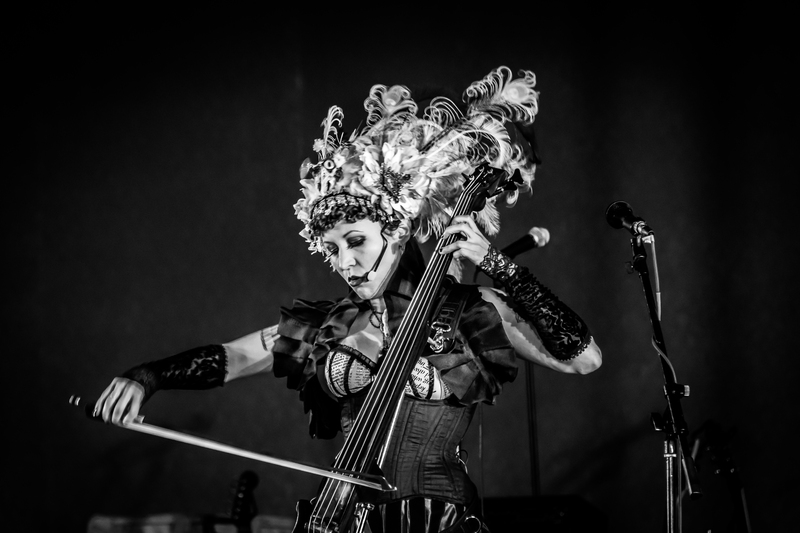 She has also collaborated with Amanda Palmer, Abney Park, Stripmall Architecture, Voltaire, Rasputina, Jill Tracy, Vernian Process, Caustic, Anthony Jones, Nathaniel Johnstone Band, Black Tape for a Blue Girl, and Attrition. Unwoman's most recent release, War Stories, is her seventh original album. Fiercely feminist and aggressively feminine, ranging adeptly from rage to sentimentality, the album draws inspiration from real life and literature including Jane Eyre, The Princess Bride, and Jane Austen's Persuasion. Circling, her sixth original album, received 2015 Steampunk Chronicle Reader's Choice Awards for Best Solo Musician and Best Album, as well as critical acclaim. From Entropic Worlds: "This quality of rich visual and emotional world building can be found in most of the songs on this record, to greater or lesser degrees, and explains why it stands up so well to many, many listenings. It's one of the things Unwoman does best, but its far from the only thing she does well." Unwoman has also released three volumes of covers in her Uncovered series and countless other songs for her ongoing Patreon. Unwoman performs solo throughout the US. She has been featured at Dragon*Con (Atlanta 2013, 2014, 2016), WorldCon (Reno, NV 2011 and San Jose, CA 2018), Steamcon I - IV (Seattle), Wicked Faire and Steampunk World's Fair (New Jersey), Clockwork Alchemy (San Jose, CA 2012-2018), Teslacon (Madison, WI), Her Royal Majesty's Steam Symposium (Long Beach, CA 2012-2015), Wild Wild West Con (Tucson, AZ 2015-2016), Emerald City Steampunk Expo (Wichita, KS 2011, 2012, 2014), A-Kon (Dallas, TX 2013), Steampunk Cruise (New Orleans & Caribbean 2013), Victoria Steam Exposition (Victoria, BC), and other major events. "The drones of a deep, hearty cello resonate under Erica Mulkey's haunting voice as she paints a portrait of love and disconnect, acceptance and anger, resolve and remorse. Unwoman's seventh record, aptly-titled War Stories, is a pained, passionate expression of feminist and feminine fury in the guise of dark dream-pop ballads and aggressive steampunk laments"
"War Stories is one of the strongest albums in the Unwoman catalogue so far. Musically beautiful and lyrically powerful it is a dynamic statement that provides a refreshing counterpoint to the male voice in alternative music. This isn't an exclusively feminist album, it is also a reflection of where society is in the 21st century, and issues that affect everyone." "And just like that, Mulkey has kept me enraptured through fifteen tracks of what should be deceptively simple: one instrument and one voice, used to amazing effect. Having witnessed her play in a myriad of settings, with electronic backing tracks, the looping pedal, and accompanied only by her cello and voice, I think I can safely say that there is little Mulkey cannot do. The possibilities are, to borrow from the album title, infinite." "Undoubtedly, the night's most successful performer was Unwoman. Known for busking in BART stations and side-manning with the band Stripmall Architecture, she took the stage in Victorian garb: lacy blouse, black-widow skirt, tiny top hat affixed to the side of her head. She sang Etta James' "At Last" in a lustrous vibrato." "Like Kate Bush or Nico, Unwoman bravely steps beyond the word of pop, or anything remotely close to rock, into an uncategorizable, adventurous vision that is nevertheless steeped in history. With its mix and match of classical instrumentation and modern-day electronics, Unwoman does not occupy a specific place or time." "You're really talented and I'm happy I can help. Please continue to slay." "Stark, politicised electro shot through with crunching noise and acoustic colours."